Editor's Note: On October 1, Carrick Brain Centers changed its name to Cerebrum Health Centers. See The Dallas Morning News' report here. The clinic, Carrick Brain Centers, defends its treatment and some of the vets who suffered from post-traumatic stress disorder swear by the results. But experts who reviewed the study for NBC 5 Investigates and The Dallas Morning News said no evidence exists that spinning someone in a chair could help symptoms of PTSD and the study was so flawed it didn't prove anything. "I think this study is essentially useless," said Dr. Paul Appelbaum, a nationally-respected professor of psychiatry at Columbia University Medical Center in New York. "If the taxpayers of Texas are out $2 million, I feel badly for them." Former Gov. Rick Perry and his office helped arrange the contract. Perry personally visited Carrick three times, according to state records obtained through the Texas Public Information Act. Perry made veterans issues a cornerstone of his failed presidential campaign this year. More dollars flowed to the clinic — even after an outside review found the unorthodox treatment was less effective and 15 times more expensive than established procedures. Carrick Brain Center's owner, Ken Beam, agreed to an interview but later declined, referring questions to a public relations company which only responded to written inquiries. NBC 5 Investigates and The Dallas Morning News teamed up to investigate the study in April and filed more than two dozen open record requests with state agencies for emails, budget documents and public officials' calendars, including Perry's, to piece together the timeline. They reveal the project had problems from start to finish. This is the story of desperate war veterans seeking help to battle the horrors of combat, a state-funded study that experts consider flawed, a chiropractic clinic plagued by infighting and legal battles, and a spinning chair that some said works wonders but others said is of limited use. Carrick Brain Centers was formed in early 2012 by North Texas businessmen Ken Beam, who owns a shipping company near Dallas/Fort Worth International Airport; Michael Budagher, a Dallas investor known for making money in the early days of the cellular phone business; and Gary Cagan Randall, a chiropractor. A video of the grand opening posted on YouTube showed a smiling Beam introducing the company's namesake, Frederick "Ted" Carrick, a Canadian-born chiropractor who lives in Florida. "We are blessed that he is here tonight," Beam said of Carrick at the ceremony. "He is the guy who came up with everything we are doing." The device, which looks like an amusement-park ride or a NASA gadget, spins strapped-in patients around and even upside down. The idea, simply put, is to increase blood flow to stimulate damaged parts of the brain to cure a number of ailments. At the kickoff ceremony at the clinic's offices on the first floor of an office tower in Las Colinas, Carrick also was full of praise. "This facility has just been open a very short period of time and already patients are coming from across the globe," Carrick said. "We are just so very, very proud." Carrick worked at a second Carrick Brain Centers clinic near Atlanta, which opened about the same time as the one in Irving. He earned $350,000 a year and became the face of Carrick Brain Centers in news reports and in promotional videos. 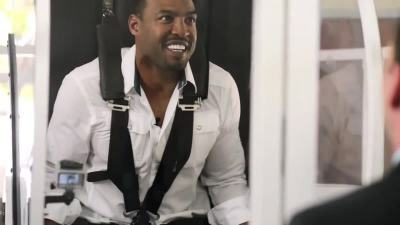 Former Dallas Cowboys defensive back Darren Woodson in the spinning chair. Some of the earliest patients were Dallas Cowboys. "I would say nothing but the best for them," said former Cowboys running back Tony Dorsett, who sought treatment for memory issues. "If the Carrick Center was closer, I'd go there every day if I could." Former Cowboys defensive back Darren Woodson appeared in a promotional video. "It's hard to explain how good I feel," Woodson said. "It's almost emotional knowing where I've been to where I am now and it's been a great experience." Another early fan was retired Texas State Guard Lt. Gen. Leroy Sisco, a longtime friend of Perry's. Sisco said he took a spin in the chair himself and it cured a vision problem. "I walked out and I could see like an eagle," he said. Sisco said a friend told him about the clinic. Sisco said he then told the governor and ex-Navy SEAL Marcus Luttrell about the work Carrick Brain Centers was doing. That's when Perry and Luttrell got on board. Luttrell, who had lived with Perry in the governor's mansion for two years and whom Perry called his "second son," became a patient. "I went through the program," Luttrell said in a promotional video. "Once my head got fixed, everything else falls into line." Taya Kyle, the widow of slain Navy SEAL Chris Kyle, appealed online for donations for another former SEAL to receive treatment at Carrick Brain Centers. Luttrell did not return emails seeking comment. Taya Kyle declined to comment. 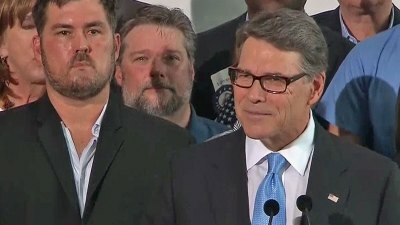 Foreground: Ex-Navy SEAL Marcus Luttrell, left, and former Texas Gov. Rick Perry, right. Perry paid a visit to the clinic early on — barely a week after the facility received its certificate of occupancy from the City of Irving and before it had registered with the Texas Board of Chiropractic Examiners. It was June 3, 2013. According to the governor's calendar, he and former state representative Suzanna Hupp, who was working for the Health and Human Services Commission, met with Beam and his team. Hupp, also a chiropractor, declined to talk about the meeting when contacted by NBC 5 Investigates and The Dallas Morning News. In the coming months, Perry's office would help arrange a state contract to study the unproven treatment: Did it really work? In September 2013, veteran Jeff Broaddus wrote to Perry at a private email address, "I'm looking forward to starting the treatment protocol at Carrick tomorrow … I promise you an honest assessment of what I find up here." By then, the wheels were already in motion for the state contract. Word about Carrick's treatment and apparent success was spreading among veterans across the country. Broaddus did not respond to calls seeking comment and no other emails between he and the governor were released. 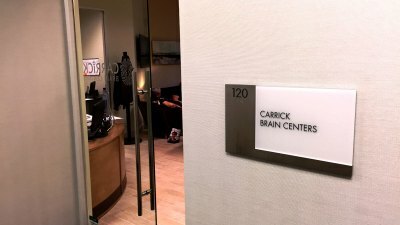 The spinning chair — the signature treatment at Carrick Brain Centers — is the focus of a heated legal dispute. Woman in Carrick Brain Centers' spinning chair. At the time clinic owners were hosting the governor, they were just days away from filing a lawsuit over who owns the patent. Carrick Brain Centers had purchased a rotational chair from a Colorado company, UltraThera Technologies, which calls its chair the GyroStim. UltraThera's owner Kevin Maher said he invented the device to help his daughter who was born three months prematurely and had cerebral palsy. "I know this chair has a purpose," he said. "This is God's way of answering my prayers for my daughter and the prayers of so many other people who have nowhere to turn." Carrick owners Beam and Budagher tried to buy the patent, Maher said. "They were saying this is a multi-billion-dollar industry," Maher said. "I was interested in doing business with them at first (but) as we went down that path together, it wasn't the right move for my company or the GyroStim." Beam and Budagher bought a similar patent involving an older technology. And just four days after Perry's first visit, they sued Maher, accusing him of infringing on their patent. The suit, filed in federal court in Colorado, is still pending. Through his attorney, Budagher said he believed Maher was infringing on Carrick's patent and "that if something could not be worked out amicably, BSI would be forced to take (legal) action." BSI is Carrick Brain Center's parent company, Brain Synergy Institute. Meanwhile, Maher accuses the clinic of stealing his invention. Carrick's website shows a picture of a rotating chair under the headline "Patented OVARD" -- for Off Vertical Axis Rotational Device. Maher said it's his Gyrostim — with his label ripped off. To complicate the dispute even further, Budagher filed another lawsuit two weeks ago against Carrick Brain Center's parent company over a rotational device he claims he invented. Budagher alleges in the suit, filed in Dallas County District Court, that Brain Synergy Institute has applied for a patent for his device. Carrick Brain Centers said it could not comment on pending litigation. Dr. Kyle Janek, appointed by Perry to be executive commissioner of the Texas Health and Human Services Commission, supervised the agency when the no-bid contract was awarded. Janek signed off on the first round of funding — which ended up being about $800,000. He declined to be interviewed but did respond to written questions. He said the unusual treatment seemed promising and deserved to be studied. "As a physician trained in traditional medicine, I am naturally skeptical of any new treatment," he wrote. "But to a small segment of veterans at the end of their rope — it appeared it could be a lifesaver." "We Can Only Commit $750K"
The Health and Human Services Commission — already under fire over a series of other noncompetitive contracts — agreed to fund the research at Perry's urging, a department spokeswoman said. Emails from a Perry aide confirmed the governor's involvement. There were no bids and no public discussion. The $800,000 was already slightly more than what had been discussed, according to other emails. "We need to let Ken (Beam) know we can only commit $750K," a state official wrote to then-HHSC Director Kyle Janek on Dec. 16, 2013. The first 50 veterans took part in the study in the first four months of 2014 at a cost of $16,250 per person. The veterans were tested for PTSD, treated for two weeks and tested again to see if their symptoms improved. Experts who reviewed the study for NBC 5 Investigates and The Dallas Morning News said it failed to follow basic rules of scientific research because there was no control group and the treatments varied among patients. "They say explicitly there was no standard treatment," said Columbia's Appelbaum, past president of the American Academy of Psychiatry and the Law. "They did different things for each person. So exactly what worked is not clear here if, in fact, anything worked." 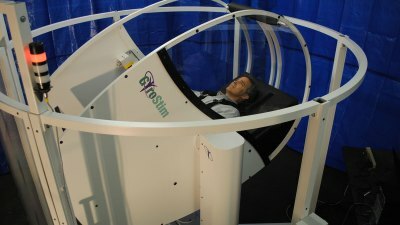 Colorado engineer Kevin Maher, who invented a rotational chair he named Gyrostim, is involved in a legal battle with Carrick Brain Center over patent rights. Retired Army Col. Carl Castro, a Ph.D. psychologist at the University of Southern California who heads research at the USC Center for Innovation and Research on Veterans and Military Families, also faulted the work. "It's not a rigorous study," he said. "It has all of the shortcomings of a study that lacks all of the proper controls." As for why vets might report feeling better, Castro noted that 40 percent of PTSD patients report getting better on their own — without treatment. Experts also wonder if being pampered and treated well for two weeks might have skewed the results. For example, a former Marine, Nicholas Koumalatsos, said he took part in the study. He wrote in a blog that he spent two weeks at the clinic. He said participants were invited to spend time in a "relaxation room," work out in a nearby gym, and fish and hunt. "Everything, from their emails to phone calls, you get the feeling they genuinely care," he wrote. Some vets came from out of state. "Putting them up two weeks in a hotel is like a vacation," Castro said. "So in some sense they proved that sending someone on vacation makes them feel better." "If you treat people nicely, they will feel better," he said. "It's true for you, it's true for me and I'm sure it's true for those vets with PTSD as well." In terms of the science behind our treatments, the vestibular system activates the entire cortex and ascending reticular system, activating neurons that make neurotransmitters, increasing vagal activation of the brain and blood flow, increasing function of the orbitofrontal lobe (where PTSD lives) and reducing inflammatory cytokines that can hurt the brain, increasing liver function that can create inflammation and increasing digestion of food that helps reduce inflammation. In addition, "repetitive peripheral somatosensory stimulation" activates the brain with a peripheral stimulus, triggering second and third order neurons and increasing function in a specific fashion, depending on where the stimulus is needed. NBC 5 Investigates and The Dallas Morning News shared the explanation with Appelbaum. "This is pseudoscientific babble that would be uninterpretable to any neuroscientist," he said. Appelbaum said no evidence exists that spinning someone could cure PTSD. The rotational chair could help people who suffer from dizziness and balance issues, he said. 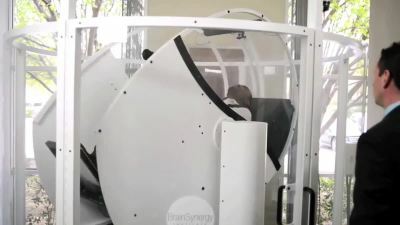 USC's Castro, formerly chief of the Department of Military Psychiatry at the Walter Reed Army Institute of Research, said research is being done to determine if the spinning chair might help people with some forms of traumatic brain injuries. Behind the scenes at the Carrick Brain Centers, there has been infighting. Budagher's lawsuit against the clinic this month was his second since he was forced out in November 2014. He filed the first lawsuit against his former partners when they allegedly missed a payment. Carrick Brain Centers paid up the next day and the suit was dropped. In a statement through his lawyer, Budagher said he had been voicing objections about how the business was being managed. The clinic's owners did not respond to a question about why they removed Budagher. In an emailed statement, Carrick Brain Centers said that Carrick "was solely responsible for designing the research plan for the state-funded study." But Carrick, in his own written comments to NBC 5 Investigates and The Dallas Morning News, said that the clinic "proceeded with a different study design without my knowledge" and that the study he designed had included a control group and other scientific safeguards. Carrick, who said he had only visited the Irving center twice, claimed he discovered that some medical documents were backdated. "We found a major problem with creation of documents that were dated before their creation date," he told NBC 5 Investigates and The Dallas Morning News. Carrick Brain Centers declined to respond to the allegation. Carrick said in March 2014, "I suggested that it was not in my best interest to offer assistance and direction in this study." But he continued his work and ultimately signed off on the research, which was published in the journal Frontiers in Public Health. "After treatment, we observed a large reduction in (PTSD symptoms) with both statistical and substantive significance," it said. As governor, Perry visited the clinic two more times — in August 2014 and in November 2014, and more taxpayer money followed. The contract was amended twice, the number of vets in the project grew to about 140, and the cost nearly tripled to $2.2 million. The increase in funding came despite an outside review in September 2014 by the nonprofit Meadows Mental Health Policy Institute for Texas in Dallas questioning the results. "While the Carrick patients showed improvements and involved populations that may be less likely to respond to established treatment … the effects observed were only one-half to one-third of the magnitude of established treatment and the costs were many times higher," the review said. The health agency contracted with the Texas Workforce Commission, which usually handles unemployment issues, to give the final batch of money to the clinic. A TWC spokeswoman said the spending was justified because many veterans with PTSD have trouble finding jobs. Janek said he alone decided to amend the contracts and spend more money. But the connection between Perry, his veteran friends and the clinic is strong. In fact, three of the vets who visited the clinic — Luttrell, Sisco and Dan Moran — stood on stage with Perry when he announced in June that he was running for president. Taya Kyle was there too. Perry declined to answer specific questions about his support of the center but he did issue a short statement through his spokeswoman Lucy Nashed. "Gov. Perry has made it his personal and professional mission to help our veterans receive the care and services they need," Nashed said. "As governor of a state with one of the largest veteran populations in the country, Gov. Perry did everything he could to address the staggering gaps in veterans' care left by the federal government." Public records show Beam and his wife Darla each gave $2,700 — the maximum allowed — to Perry's presidential campaign. "Donating to former governor Perry's presidential campaign was a personal decision, which is an option for anyone," Ken Beam said. "Carrick Brain Centers has been fortunate to receive support from various citizens and organizations." In June, just as Perry was standing alongside the well-known former patients to announce his presidential bid, there was more trouble at the clinic. Owners fired the company's namesake, Carrick, and several other staffers in the Georgia office. "I was dismissed via an email with no call or message," Carrick said. The clinic's spokeswoman only said he was fired "for cause." Carrick said he was terminated after he objected to questionable billing procedures. "Ken Beam advised me and others that if we did not participate in their billing practices then we would be terminated," Carrick said. "I refused to be part of a fraud so the termination was not a surprise." Carrick said in a demand for arbitration that the fraud involved mislabeling treatments and claiming a medical doctor did procedures when the work was really done by chiropractors. Carrick Brain Centers called Carrick "a disgruntled former executive" but declined to respond specifically to his allegations. Beam wrote, "We regret your collective news outlets are being used by a disgruntled former executive (Carrick) to further the personal interests of others who seek to damage the reputation of our practice and care providers." Beam said the clinic would answer no further questions. "I Have to Get My Name Back"
Carrick said he wants his name removed from the clinic's name. "I can tell you now that I'm just so glad that I'm not involved with them," he said. "There's a whole lot of things there that just make me crawl." Carrick said the company registered his name as a trademark — without his approval or knowledge. "I've been after them for over a year to get that trademark and my name back," he said recently. "I never authorized that. They just went and did it — trademarked my family name. It's unethical, unprofessional, but they did it." A search of the United States Patent and Trademark Office database confirms the name "Carrick" was registered by Carrick Brain Centers' parent company in May 2013. The address used in the trademark application was Beam's shipping company. "Now I have to get my name back from these people," Carrick said. Carrick Brain Centers said it plans to change names by the end of the year. NBC 5 investigative editor Don Peritz Jr. contributed to this report.